there are sacks of animal food and dust-covered machinery. associated with the Virgin Mary during Byzantine times. past are slowly and in some cases deliberately being lost to history. turning a blind eye to the destruction of Christian sites. precipitated the loss of Christian culture. concealed. It is now a mosque. in its history. Two coach-loads of Arab athletes arrive to pray. Maria church in Trabzon. The boy reportedly shouted "Allahu Akbar"
said to have a congregation of one. slit in the eastern Turkish city of Malatya. denominations. Some fear the churches may be levelled. main reason was the genocide [of 1915]." laissez-faire attitude towards the country's historic cultural sites. one of the Middle East's largest churches in south Turkey last year. stunning enclave is a monastery in name only. No one lives here now. century and again when the Ottoman empire disintegrated in the 1910s. holds no historical ties to Islam. government. It has Islamism in its mind-set." The Armenian church in the village of Kermouch in the region of Ourfa degraded by the treasure hunters of "Armenian gold"
The Armenian church in the village of Kermouch (Gamurach in Armenian) in the region of Ourfa in Turkey which was five years ago one of the tourist centers of the region continues to degrade. According to the Turkish site Urfanatik, the Armenian church in the village of Kermouch (Gamurg), built in the 19th century by seven brothers, shows signs of collapse on certain parts. According to Mehmet Güzel, a specialist in the historical monuments of the Ourfa region, the Armenian church in Kermouch was used by the Apostolic Armenians until 1915. "After 1915 the village of Kermouch was entrusted to a commander of the Hamidiés regiment, Syoumer Pasha. Presently the village is in the hands of the descendants of Syoumer Pasha. If this church were renovated, it would be a great asset for tourism in Ourfa. We want it to be renovated and reopened to worship, " said Mehmet Güzel. One of the village's inhabitants, Hussein Aslan, said that the Armenian church on the threshold of collapse is regularly visited by treasure hunters who seek in its walls and in its soil "Armenian gold" . An activity that became a "Turkish national sport" animated by the search for the supposedly hidden treasures of the Armenians during the genocide of 1915. 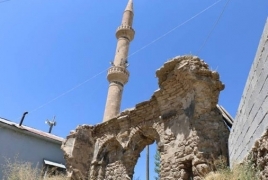 Three Armenian churches in Turkey's Van province are on the verge of full destruction, Gazetekarinci.com reports. Artsvaberd in the town of Ercis of Van, in particular, now has a lot of holes, the walls and khachkars have been destroyed, while the monastery itself has turned into a dump. Built in the 7-8th centuries, Artsvaberd was one of the greatest monasteries in the entire province and has suffered multiple attacks by Turks and Kurds. Also, the church of St Gevorg and the Surb Astvatsatsin monastery in the village of Artamet are on the brink of destruction due to attacks by treasure hunters and the local residents' negligence. Prior to the Genocide, 700 Armenians lived in the village, and a mosque was built near the St Gevorg church in thee 1990s.